A non-partisan seniors advocacy group with a "free enterprise, less government, less taxes" approach to seniors issues. 60 Plus has established ending the "death" tax and Saving Social Security for the young as its top priorities. 60 Plus has been described as an "anti-tax advocacy group" and an "increasingly influential lobbying group for the elderly...often viewed as the conservative alternative to the AARP." The nation's leading organization for people 50 and older. Includes information about Modern Maturity and the AARP Bulletin. Founded in 1965, the AoA is an agency within the U.S. Department of Health and Human Services. It is one of the nation's largest providers of home- and community-based care for older persons and their caregivers. Its mission is to develop a comprehensive, coordinated and cost-effective system of long-term care that helps elderly individuals to maintain their dignity in their homes and communities. amd to help society prepare for an aging population. "The Voice of Aging America," contains relevant news, information and links to resources. Focuses on societal and technical issues, serving to bridge the "Digital and Generational Divides." I have an aging office building, so I thought I might have something in common with the Aging Research Centre. Wrong again. The ARC provides a service that allows aging researchers -- well, researchers who investigate aging -- to find information related to the study of the aging process. The site is more scientifically oriented than consumer driven, but if you’re thinking of attending a symposium on neurobiology and neuroendocrinology, what better place to read all about it? A nonprofit, charitable organization that has dedicated over 30 years to funding research on age-related and degenerative diseases, educating the public about these diseases, and providing emergency financial assistance to Alzheimer's disease patients and their caregivers. Publications are available on Alzheimer’s, macular degeneration, glaucoma, heart disease and stroke information. An attractive, easy-to-navigate site that lists numerous facilities and other senior-care options, organized by state, then by city. The site provides excellent advice, including the recommendation that if you are researching assisted living for yourself, a friend or loved one, that you research each facility thoroughly. It is also imperative to visit a facility, as well as checking health and safety records and possible violations that may have occurred within the facility. In Assisted Living facilities, residents live independently in apartment-style accommodations or a residential setting that offers choices in personal care and health-related services. Make this site the first stop in your research. This is a nationwide directory of senior housing with a particular focus on assisted Living. Search by zip code, city, or state to compare assisted living facilities or other senior living options. This is a great way to do preliminary research on the facilities in your area, narrow your search down to a few and schedule a tour with those facilities. Launched in 2007, AMAC was created to offer anyone age 50+ an alternative perspective to AARP's, and to address and resolve problems faced by seniors today. AMAC's focus is the preservation of “the traditional American values of faith, family, and freedom.” Discounts for AMAC members include hotel and motel discounts at thousands of locations across the country, discounts on auto and homeowners insurance, as well as discounts in local areas. Visit the "Become a Member" section to learn more about AMAC and how it differs from AARP. Canada's most comprehensive guide to seniors' housing and care services, including retirement homes, long term care homes, homes for the aged, and community support services. Sponsored by the University of North Carolina, the Center's mission is to address, through research and training, health disparities in later life, provide a forum in which to discuss and examine ethnic, racial and cultural variation in life course processes and to disseminate research findings to the academic and lay community on the health of older diverse populations. Award-winning research site for professionals and family members looking for information on aging, eldercare, and long term care, including information on legal, financial, medical, and housing issues, policy, research, and statistics. Searchable information on government services of interest to older Americans, covering topics that range from Social Security and employment to travel and consumer issues. "Empowerment through humor." Don't miss this site! Established in 1945 to promote the scientific study of aging. Includes links to related sites, news releases, newsletters, events calendar. "Serving savvy seniors since 1995," this site provides articles, links to free resources, a shopping area, as well as national and world news, health and science news, and sports. Sue Johnson and Julie Carlson, mother-in-law/daughter-in-law co-authors of Grandloving: Making Memories with Your Grandchildren, 4th edition have been helping families connect since they wrote their first edition of Grandloving in 1996, and they can help you too! A spin-off from their award-winning comprehensive sourcebook, Sue and Julie’s warm, upbeat family-friendly site features fun, low-cost activities for babies to teens...grandparenting tips from hundreds of families...do-together and long-distance projects...heartfelt ideas for holidays, visits and family traditions...helpful resources and reviews of their favorite books. A nationwide directory of in-home senior care services, this site allows you to search by zip code to find home care agencies that service your area and compare services. You can use this free service to do preliminary research or you can use it to make contact and schedule a personal consultation with a care provider. Providing quality health care and health information to older adults. A cooperative effort of the Schools of Allied Health Sciences, Dentistry, Medicine, Nursing, Optometry and Social Work. Visit the Aging Related Links and the Age Pages, in particular. Dedicated to providing information to help us live healthier, longer lives, this site provides the latest research-based information on a wide range of age-related diseases, conditions, issues, features, and news. Infoaging’s content about groundbreaking new aging research is tailored for a non-medical audience. This site’s objective is to become one of the leading consumer resources for aging and research-related information. Janska-- "Clothing that Comforts"-- was founded by Jan Erickson who after caring for stroke patients was inspired to design high quality, stylish Polartec Fleece garments that offer warmth, comfort, ease of use and care, and a wonderful sense of security to the special needs person as well as the entire family. Formerly, the American Association of Homes and Services for the Aging (AAHAS), LeadingAge’s Consumer Hub offers information and support to help people make the most of the aging experience. Included is a directory of not-for-profit organizations committed to meeting people’s needs and preferences as they age. Provides assistance in determining Medicaid eligibility and the Medicaid application process. MySeniorCare’s mission is to support families and their aging loved ones during a highly stressful time as they search for information, resources and providers of senior care. Families are provided with a wide range of support and credible information, including more than 500 articles reviewed by industry experts serving on the site's advisory board, as well as a senior care directory with ratings and reviews that only lists pre-screened providers of senior care. Sponsored by the National Senior Citizens Law Center (NSCLC), established in 1972 to help older Americans live their lives in dignity and with freedom from poverty, through legal work in support of elderly poor clients, client groups, and Elder Law Attorneys. NSCLC attorneys are knowledgeable in a broad range of legal issues and practice areas that affect the security and welfare of older persons of limited income. An excellent resource for senior living and care options. Created to help you to make informed, comfortable decisions about your own or your loved one's future. Whether you are looking for an independent retirement community, assisted living facility, nursing home, Alzheimer's care, home or hospice Care, or other senior product or service, New LifeStyles Online can help you find what's right for you. A national nonprofit educational organization designed to enhance the quality of life for mature adults. Offering challenging programs in the arts, humanities, wellness, technology and volunteer service, OASIS creates opportunities for older adults to continue their personal growth and provide meaningful service to the community. Membership in OASIS is free. This guide has been created for the purpose of guiding older citizens and family members through the sometimes cumbersome process of purchasing and maintaining real estate. Information is presented in clear, concise and easily digestible format. "Premiere retirement living through the Internet." Finding your ideal retirement location has never been easier. Use the search features to locate a home or community, by city, zip code, or region. Offers news, health, entertainment, travel, and lifestyle information, plus more than 5,500 movie reviews and 2,500+ articles on grandparenting, retirement communities, RVing, and more. This is an interactive community with a focus on retirees, seniors, and the baby-boomer generation. Registration is free and one need not be retired to participate. A nonprofit organization providing educational adventures all over the world for older individuals. RoadScholar is for people on the move who believe learning is a lifelong process. The organization offers more than 10,000 programs each year in more than 90 countries. Home of the popular "Savvy Senior" newspaper column that appears in hundreds of newspapers, here you'll find recent columns, links to other useful sites (including Mr. Modem's), and lots of helpful information for older individuals. Find Assisted Living, Alzheimer's Care, Retirement Communities and Home Care in this nationwide, free directory that can be browsed by state and city. Compare photos. maps, prices, amenities and services offered. The publisher offers a care advisory service and is a BBB-certified company. Information about senior support services throughout the United States. Where senior citizens, their families, attorneys, social workers, and financial planners, can access information about elder law, Medicare, Medicaid, guardianship, estate planning, trusts and the rights of the elderly and disabled. A comprehensive information resource for members. Members (it's free) include both senior living communities and individuals seeking senior housing or other appropriate senior services. For housing and lifestyle choices and how to plan and pay for them. Resources listed by state. An online directory of senior services and senior-related products. Seniors, older individuals, caregivers and industry professionals across North America will find the senior services they’re looking for quickly and easily on this user-friendly site. Products and services for those of us in our "second fifty" years. Great products, great pricing. Offering active seniors, boomers, and retirees an affordable opportunity to enhance their summers through education, leisure, and discovery, at campus locations across the United States and Canada. This site creates an environment where members and visitors can communicate with family and friends, research information relevant to their daily lives, share stories and experiences and purchase products and services safely. Senior.com also provides important information that can be helpful to family members and caregivers. SeniorCare.net is committed to helping seniors and their families find the best care for themselves and loved ones by providing the latest information and resources available. A national eldercare resource, referral and consultation web site for seniors, their families, and providers. SeniorLink provides access to eldercare professionals, programs, providers, facilities, and agencies that provide information on a variety of senior related services. Seniorlink is committed to helping seniors age with dignity, including the ability to live in the least restrictive setting. Dedicated to providing older adults education for and access to computer technology to enhance their lives and enable them to share their knowledge and wisdom. “Your guide to sites for seniors, because being senior is more than just getting older." I could be wrong, but isn’t it when we stop getting older that’s of greater concern? Maybe it’s just me. The objective here is to provide information to enhance the time spent online by delivering a comprehensive directory of informative content and links to sites of interest to seniors. SPRY helps people prepare for successful aging by emphasizing planning and prevention-oriented strategies in four key areas: Health & Wellness; Mental Health; Financial Security; and Life Engagement. The focus here is senior and assisted living by city and state. The site features best cities for retirement and provides reviews from seniors living in each city. Access to a seniors general-issues blog is also provided. A premier provider of quality clothing and solutions for people with special needs, including, decreased mobility special needs clothing, comfortable and fashionable elderly care clothing, larger clothing sizes for special needs ease and comfort, easy-wear clothing for people with arthritis, foot-problem products, and easily washable clothing. Silvert's has been helping caregiveres for more than 70 years. 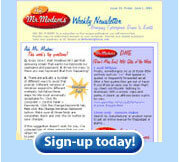 A popular weekly e-zine for everyone over 50, who feels much too young to be old. (I can relate!) Voted “American¹s Most Trusted Senior Site,” and enjoyed by two million readers each month. Here you’ll find 2,400 pages of senior-related humor, travel, nostalgia, trivia, senior advocacy, hundreds of senior links, and lots of useful information. A Web-based community owned by ThirdAge, Inc., an online media and direct marketing company with a focus on serving the needs of midlife adults -- generally those in their 40s, 50s, and 60s -- and those who want to build a genuine relationship with them. "ThirdAge" refers to the concept of lifelong learning, self-development and fulfillment, and the period of life following young adulthood, yet preceding "seniorhood" and retirement. Founded in 1991, the USA, Inc., is a nonprofit, nonpartisan organization dedicated to defending and promoting retirement, financial and tax freedom for older Americans and their families. Hosted by ComfortKeepers, this site presents a variety of interesting sites geared especially to the senior demographic. Links to thousands of sites with a particular focus on the age 50+ demographic.